Scabiosa is a genus in the teasel Family Dipsacaceae of flowering plants. Many of the species in this genus have common names that include the word scabious; however some plants commonly known as scabious are currently classified in related genera such as Knautia and Succisa; at least some of these were formerly placed in Scabiosa. Another common name for members of this genus is pincushion flowers. Members of this genus are native to Europe and Asia. Some species of Scabiosa, notably small scabious (S. columbaria) and Mediterranean sweet scabious (S. atropurpurea) have been developed into cultivars for gardeners. Illustrated here is the Scabiosa columbaria cultivar 'Pink Mist'. Scabiosa plants have many small flowers of soft lavender blue, lilac or creamy white colour borne in a single head on a tall stalk. Scabious flowers are nectar rich and attract a variety of insects including moths and butterflies such as the Six-spot Burnet. Scabiosa species are also used as food plants by the larvae of some Lepidoptera species including Grey Pug. Brachyscome iberidifolia (Swan River Daisy) is a delightful, easy to grow small shrub 15cm to 45cm and is native to Western and central Australia. Masses of purple, blue or white flowers from Spring to Autumn. Ideal for mass planting along borders, rockeries, as ground cover, in tubs or hanging baskets. Brachyscome is a genus of around 70 species of mostly annual and perennial herbs and a few subshrubs in the daisy family Asteraceae. 65 of these are endemic to Australia, the remainder being found in New Zealand and New Guinea. They have typical "daisy" flower heads with showy ray florets in shades of white, pink, mauve, violet or blue, surrounding a usually narrow group of yellow disk florets. The leaves are often dissected to varying degrees but may be linear or spathulate. In growth habit they vary between plants with a rosette of basal leaves and more-or-less leafless flower scape, and those with mostly cauline leaves and often prostrate stems. Malva sylvestris is a species of the Mallow genus Malva in the family of Malvaceae and is considered to be the type species for the genus. 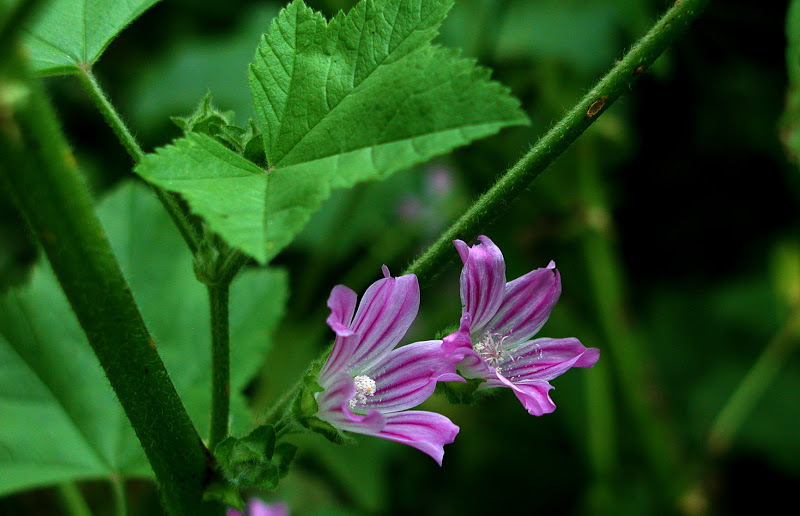 Known as common mallow to English speaking Europeans, it acquired the common names of cheeses, high mallow and tall mallow (mauve des bois by the French) as it migrated from its native home in Western Europe, North Africa and Asia through the English speaking world. M. sylvestris is a vigorously healthy plant with showy flowers of bright mauve-purple, with dark veins; a handsome plant, often standing 1 metre high and growing freely in fields, hedgerows and in fallow fields. It is a year since I first started this blog and I wish to thank all of the people who follow it and who contribute to it each week. It is a pleasure to have you join in and to see your glorious flower photos! 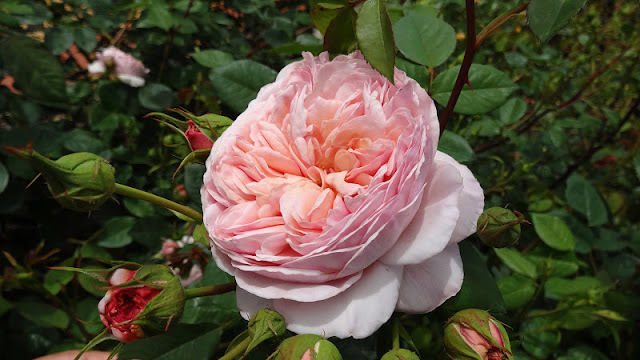 Rosa "Evelyn" from David Austin was bred from Tamora x Graham Thomas. The rose has the typical Austin cupped /rosette form. Evelyn is known for the beauty of the blooms, for their fragrance and for a marvellous display at flowering time. The plant has a neat vase shape at the base, then reaches both up and out. It grows to about two metres tall with some canes spreading about the same width. Basals are produced readily, and throw candelabras of bloom - bearing huge, lush, drooping panicles of soft pink blossoms. Older canes tend to bloom with single buds, or in twos and threes. Veronica is the largest genus in the flowering plant family Plantaginaceae, with about 500 species. Taxonomy for this genus is currently being reanalysed, with the genus Hebe and the related Australasian genera Derwentia, Detzneria, Chionohebe, Heliohebe, Leonohebe and Parahebe included by many botanists. Common names include speedwell, bird's eye, and gypsyweed. The species are herbaceous annuals or perennials, and also shrubs or small trees if Hebe is included. Most of the species are from the temperate Northern Hemisphere, though with some species from the Southern Hemisphere. 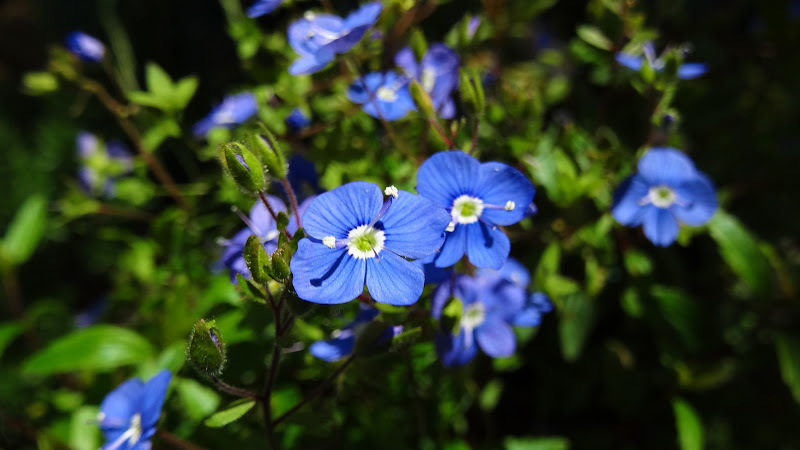 Veronica chamaedrys (Germander Speedwell, Bird's-eye Speedwell - shown above) is a species of Veronica, native to Europe and northern Asia. It is found on other continents as an introduced species. It is a herbaceous perennial plant with hairy stems and leaves. It can grow to 25 cm tall, but is normally about 12 cm tall. The flowers are blue, with a four-lobed corolla. The form of the leaves are similar to white deadnettle. The 2 to 4 mm wide blossoms of this plant wilt very quickly upon picking, which has given it the ironic name "Männertreu", or "men's faithfulness" in German.